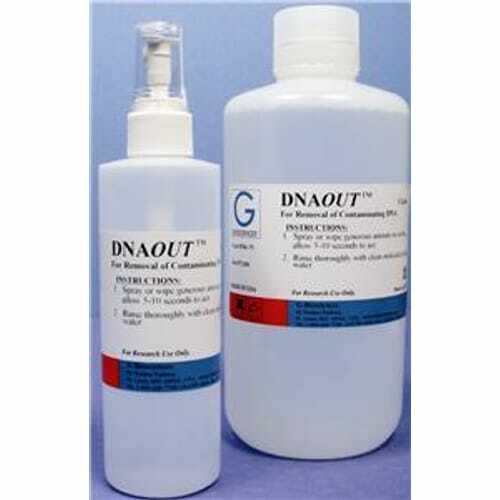 DNA OUT™ is formulated to quickly remove DNA and RNA contaminations from glass and plastic wares. Simply spray and rinse. DNA OUT™ is non-toxic and leaves no residues to interfere with downstream applications. The fast acting DNA OUT™ allows laboratory equipment and work areas to be made free from DNA contamination. Ideal for cleaning microfuge tubes, reaction tubes, PCR machine surface, pipettes, lab benches, lab equipments, and so forth. DNA OUT™ is supplied in 250ml easy to apply spray bottles. For economy, refilling spray bottles, or cleaning large items, DNA OUT™ is also available in 1 liter containers.